When you're at the farmers' market, look for Red Russian kale, an heirloom variety that, despite the name, is purple and gray-green. 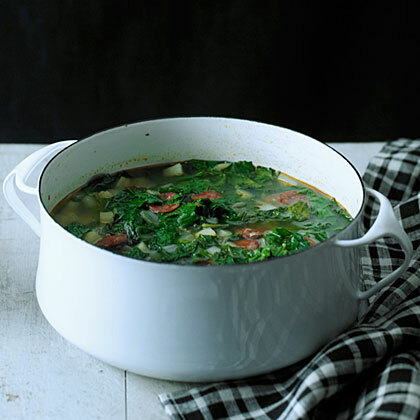 Its tender texture and mild flavor go well in this lightly spicy soup. Cook chorizo in oil in a pot over medium-high heat, stirring often, until browned, about 5 minutes. Transfer chorizo to a paper towel with a slotted spoon. Add onion to fat in pot and sauté until softened, 3 to 5 minutes. Stir in garlic, chile flakes, and pepper; cook about 1 minute. Add broth and potato; cover and bring to a boil. Reduce heat and simmer until potato is tender, about 5 minutes. Stir in kale and chorizo; cover and bring to a boil. Reduce heat; simmer until kale is tender, 3 to 5 minutes. Season with salt.